Every year the UK Home Office publishes statistics showing the number of procedures carried out on animals covered by the Animals (Scientific Procedures) Act, 1986; this covers all vertebrate species. Overall, the number of animals used in research fell slightly from 4.03 to 4.02 million (0.4% fall). The total number of procedures was slightly higher, at 4.12 million, as some animals were used for more than one procedure (a 0.3% rise from 2012). Overall, 98% of animals used in scientific experiments were mice, rats, birds or fish, while dogs, cats and primates (which are offered special protections under UK law) combined, remain under 0.2% of the total. The number of non-human primates rose 11% from the previous year, however a sharp decline in 2011 means primate use remains lower than for any year prior to 2011. 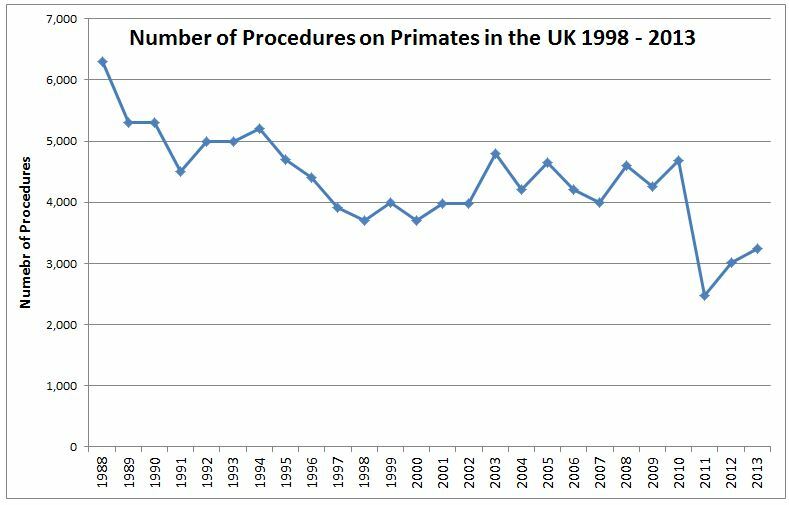 Note that the graph above uses procedures, not numbers of primates (as they were easier to collate). In 2013 the number of primates used was 2,202, up slightly from 2,186 the year before. A ban on cosmetic testing on animals (1998) and of using great apes (gorillas, orang-utans and chimpanzees) in research (1986) meant both had 0 procedures in 2013. Similarly, efforts to phase out tests on household products meant that no animals were used for this purpose for the third year running. Which is a curious way of describing a small drop in the number of animals used. The BUAV could also be found to be cherry picking the statistics on Twitter. In a set of tweeted pictures they spoke of the 7% rise in primate procedures (whereas numbers of primates rose only 1%), then switched to describing an 11% rise in the number of dogs used, neglecting to mention that procedures on dogs had fallen 1.3%. Posted on July 10, 2014 August 24, 2016 by EditorPosted in News, Outreach NewsTagged animal experiment statistics, Animal research statistics, animal testing in the uk, animal testing statistics, UK animal research. Next Next post: Why is alcohol research with nonhuman animals essential?